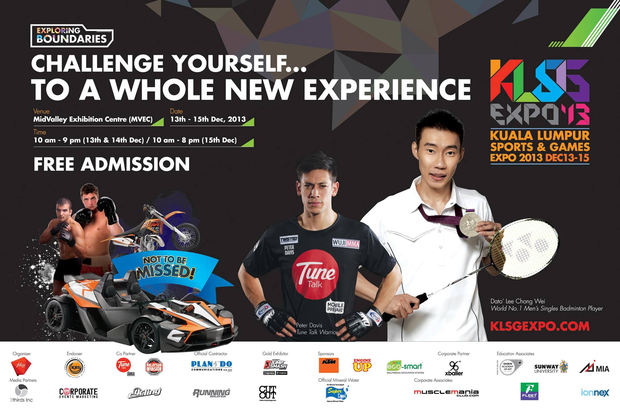 Mark your calendars for the largest sports and games event ever seen in Malaysia. With four categories; National Favourites, HealthFit, Adrenaline Rush, and E-Games, visitors are bound to find something they like. Feast upon the ambience and participate in fun activities we have line up for visitors all day long. Take part in activities with the Challenger Card and win freebies and lucky draws. Who knows you might drive away in a car. Compete in racing simulator challenge and online gaming competition and walk away with attractive prizes. Watch cultural, dance, and martial arts showcases on the main stage. We have lined up a series of interesting performances to keep you entertained for all three days. Tired from all the activities? Go relax in the art exhibition area or the sports gallery section. Get good deals on goods and check out the latest in sporting or gaming equipment.